One night at a concert, A.J. made a brave move and decided to talk to the girl behind him, but all he could come up with was "I bet I know when your birthday is!" (The two had mutual friends at the concert, and earlier that evening her birthday had come up in conversation, which prepared him for his pickup line!) The two continued to talk all night long and in the following days over the phone. A few weeks later they went on their first date and have been together ever since. With a little help from Sarah for the venue and time, A.J. planned a weekend getaway at an inn in Asheville, North Carolina. They enjoyed a full day of breakfast, driving, hiking, and a beautiful dinner. After dinner, the couple sipped on wine near fire pits before taking a photo by a waterfall. A.J. took Sarah's hands in his to share some meaningful words before handing her an envelope which held his concert ticket from the night they met. As Sarah read the words "Will you marry me?" on the ticket, A.J. bent to one knee. Their garden party themed wedding was centered around their lakeside venue at Smith Mountain Lake, which offered surrounding views of the mountains. 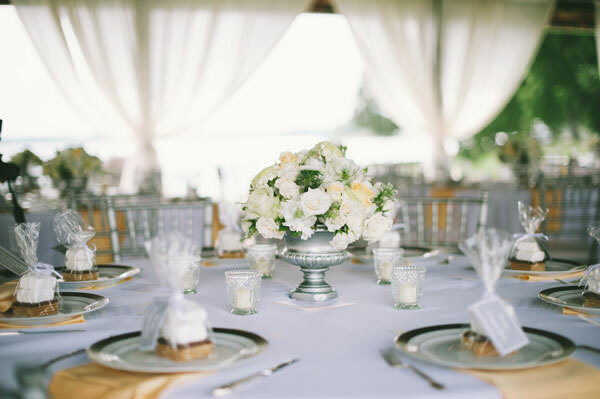 Bistro tables, Adirondack chairs, and a vintage wedding lounge served as décor as well as seating for guests to enjoy their day on the lake. It was important that guests have fun while in attendance, so games like corn hole, lawn Jenga, and bocce ball were set up on the lawn. Gray, white, and yellow set the color scheme for the wedding, which tied the games, décor, and scenery all together. They also had a fire pit for making s'mores, which served as the wedding favors, and a bar was set up to greet guests with a drink. For the ceremony, a window frame draped with white linens and flowers served as the arch. Jars filled with ivory peonies, ranunculus, and spray roses hung from hooks lining the aisles alongside white chairs. This set the scene for Sarah's most memorable moment: seeing A.J. at the end of the aisle. For the reception, the pavilion was covered in garden lights to create a romantic venue for guests to enjoy great music and food. After their sparkler sendoff and boat getaway, the couple honeymooned in Antigua. Be sure to see the Eller wedding on page 62 of the third issue of bridebook!